Airy, light filled, spaces are considered the pinnacle of modern living and have the benefit of adding value to a property and making a space feel larger than it really is. As such, they tend to top many homeowners wish lists – sound familiar? So, whether you are planning an extension, building an orangery or renovating an existing space, you'll likely want to think about making steps to ensure there is as much natural light as possible. Find everything you need to know, with our tips on how to create space and light with glazing. Taking on a larger project? Our ultimate guide for your house extension, as well as our guide to how to renovate a house are essential reading. Do you need planning permission to install glazing? All glazing installations are subject to inspection and approval by your local authority and you may need planning permission to replace or install new glazing. That said, permission will not be needed if the new doors and windows are similar in appearance to those used in the construction of the house. Use our beginners guide to planning permission for expert advice. You can also find out more at planningportal.gov.uk. Ideal for period properties, orangery-style extensions provide all the benefits of a glazed addition, but tend to be much more traditional in style, with the most successful mimicking the original building’s architecture. Unlike conservatories, orangeries have glazed walls coupled with solid walls, and are defined as much by their frames, and the shape they create, as their glazing. Find more expert advice and inspiration in our guide to how to build an orangery. A glass box extension makes a strong design statement in both super modern and more traditional homes. Just be aware that small glazed extensions should fall into your property’s permitted development rights, but large rooms may need planning permission. Wondering how to plan and design a glass extension? We've covered it all in our handy guide. Filling gables with an expanse of glazing is an excellent means of introducing light. This design feature can make for a great focal point both internally and externally, and can be adopted in traditional schemes, as well as more contemporary homes. Combining with timber is a good idea (think oak frame structures and timber-clad ceilings), as the material softens large areas of glazing. Often an overlooked feature in the home, staircases can play a big role in the way light moves between the various levels of a property. Whether you opt for a rising, helical or zig-zag design staircase, choosing open treads will give a greater sense of space and allow light to flow throughout the space. Designing a staircase from scratch? or planning a renovation? Read our guide to how to design a staircase. 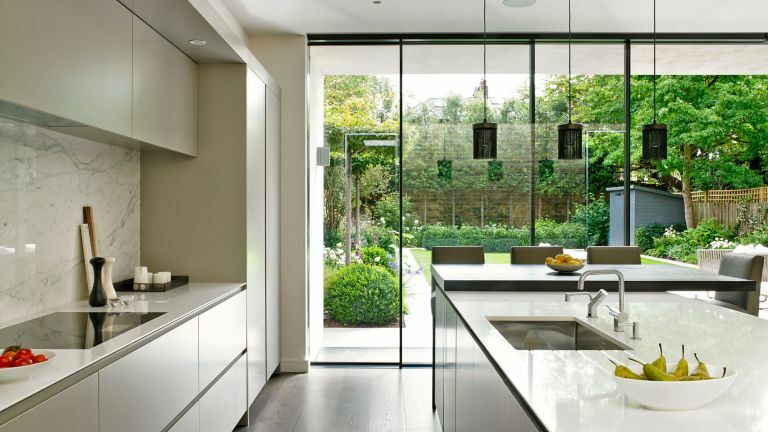 Bi-fold or sliding doors are one of the most popular options for maximising natural light in the home and are often installed as part of an extension or renovation project. In comparison to adding a whole glass extension they can also be a relatively inexpensive way to add some wow-factor to your space. Our guide to bi-fold and sliding doors offers advice to ensure you choose the right option for your homes. While it may sound obvious, planning in a double-height space – whether a hallway and landing or living space with mezzanine level, for instance – is one of the simplest ways to ensure light flows through the entire space. Roof windows, or rooflights as they’re also known, are an easy and inoffensive way of flooding a space with light. Whether installed into a converted loft or into the roof of a new extension, a roof window can offer up to 40 per cent more natural light than traditional windows. Sound like the solution for you? Read our guide to how to choose rooflights. Suited to modern spaces and period properties, roof lanterns not only fill a space with natural daylight, but can add drama and height to the interiors. We think they’re a particularly great addition to work into a kitchens extension or garden rooms. Who says windows have to be on the exterior of the building? Internal glazing is effective in dividing a space without reducing the flow of natural light. Metal frame doors and windows are the best option if you're designing a space with a contemporary feel – our buyer's guide to metal windows and doors includes advice and our pick of the best. Looking for more glazing inspiration?